Upcoming Events — New Hope Shelter, Inc. Learn how you can live out your calling! Come learn how you can Follow Christ and Build the Community! 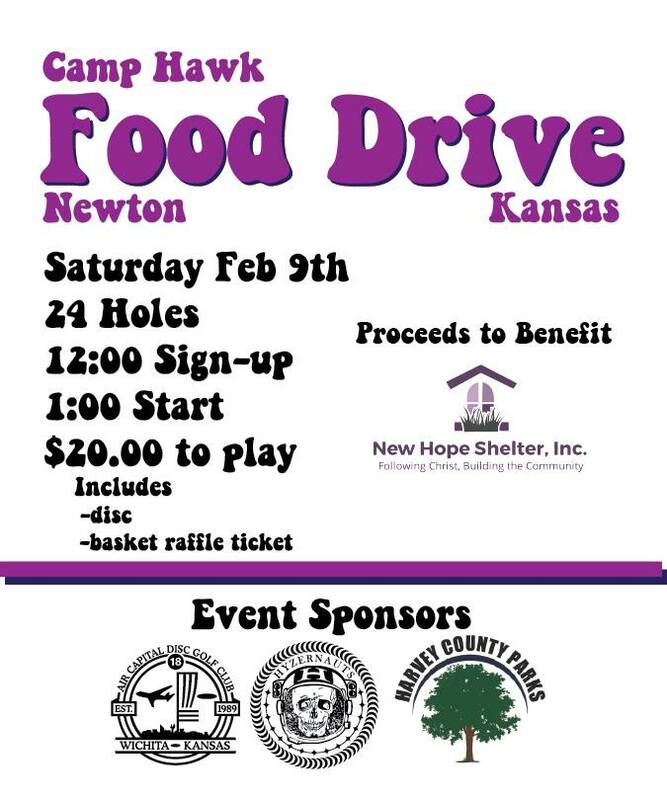 Join local disc golf players and support New Hope Shelter. Come learn how you can join the team at New Hope! As temperatures are dropping and we sit in our warm, cozy homes, there are local men, women, and children who are in need of a place of warmth, security, and hope. New Hope Shelter has provided care to these men, women, and children experiencing homelessness in Harvey, Marion, and McPherson Counties since 2005. In those years, New Hope Shelter has cared for over 2,100 people in their time of need! Not only do we provide a roof over their heads and food in their belly, our ministry is designed to stabilize, encourage, and disciple all who come through our door. Our ministerial programming includes money management/budgeting, Biblical based job skills, individual case management, bible study, and a Christian 12-step program. This programming combined with our rules and guidelines, which are based on Christian morals and ethics, bring our residents into a deeper and more meaningful relationship with Christ. As a community-based 501(c)3 nonprofit, we depend solely on the generosity of individuals, churches, and businesses to support our ministry. We ask that you consider a financial gift to our vital community ministry! Every dollar ensures that these men, women, and children have a safe and secure Christian environment to heal, regroup, and transform. Through your support, lives are renewed and communities are changed! In 2017, New Hope began our Life Restoration Program to disciple those we are serving. Here are a few of the highlights thus far in 2018! · Through October 31, we have had 234 intakes (55% men, 32% women, 13% children/teens) which puts us on pace of surpassing our number of intakes in 2017. · Over 63% of those who are employable are employed when they exit our Life Restoration Program. This is a 42% increase from intake. · Over 72% of all Life Restoration Program participants exit with an income! · New Hope has assisted with permanently housing over 72% of our participants! As we approach the end of our fiscal year, we invite you to join us in support of our wonderful ministry. All donations are tax deductible! Through your support, we believe that as we follow Christ and care for those in need, we are strengthening our communities and God’s presence within them!